Question: I have arrived at the convention in the desert, and seeing such great friends around me, I am asking: why was I honored to be part of this great society because I myself have nothing special? Answer: None of us chose this path by ourselves, but we were brought from Above. If we understand this, we have to give thanks for this. The Creator brings a person to the good fate and tells him, “Take this!” Everyone was brought here because the time had come for his soul to begin correction and become consciously included in the general mechanism, called Malchut or Divinity. But if the Creator brings a person to this choice, it does not mean that everything will continue without our efforts. Our efforts have to become more and more conscious. Everyone has already been disappointed in his life, in his desires, and has gone through a lot: graduated from a university, worked in a few places, served in the army, got married and divorced. But I did not do all that. When I look back, I do not believe that I have done all that and it all happened to me. I start to realize that I was led through all these events from Above. Although I empathized emotionally, my sensations were evoked in me from Above. But from now on, I am given freedom of choice, which I can use. There are many that come and go. As a result, they will come back some time in the future. Before the convention, I received many letters from my former students who have long left the study, became disappointed, but now decided to return. This is also fate; we should not think that it was their own decision; the upper management ordered them. Therefore we need to accept them back, and so we opened this convention for everyone. Everything that has been done with you until today happened because you were allowed to strengthen yourself and take care of others, and we need to give thanks for it. Living For The Body Or For The Soul? Question: Some people are in great inner tension during the convention; others are joyful and going along with the flow. What should be our correct state? Answer: Both are correct, and it is necessary to join these two states so with all your strength and great tension to try to go with the flow, to stay as close as possible to the center, and move together with it. We need to be included in the flow of the convention like two liquids that are mixed together. But for this, I need to apply efforts, of course, because every moment I must feel that I move. I cannot go towards the goal without this movement, I must keep the same direction all the time, like a rocket which constantly adjusts its trajectory: alternately, once the force of reception, then the force of bestowal, the force of reception, then force of bestowal. I keep balance between the two, without erasing any of them; I do not lose the awareness of my desire (Aviut), but connect all this together and advance. There are people who naturally integrate into the general flow because their desire is lighter in comparison to others. No one is to blame or to be praised; everyone has his own natural character. And there are people with more severe, internal tension who cannot go with the general flow, and it takes them great efforts. The first ones, who easily merge with the environment, add inspiration to everyone. And the second, for whom it is difficult to be with others, add effort. It turns out that there is the Reshimo from the screen and from the desire (Reshimo de Hitlabshut and Reshimo de Aviut), and thus general connection occurs. Only Responsibility, And No Excuses! Question: What is special about The Book of Zohar? Answer: First, it is special since Kabbalists wrote it. Humanity climbed down from the trees and began to evolve until the first eruption of the ego during the time of ancient Babylon. Then the method of correction was revealed in this first egoistic wave. Because people couldn’t overcome the great ego by themselves, they began to look for means to do so and found the wisdom of Kabbalah that enables a person to overcome the evil inclination through connection. Those who began to use this method in order to correct themselves are called “Israel” which means Yashar—El, “straight to the upper” (ISRA-EL). In the meantime, the ego continued to grow even more and all the other nations went on as usual. Abraham’s work in Babylon was easier if we may say: to rise above the ego to the Creator (Boreh) in love and connection and to do what is good for others, for strangers, since the ego wasn’t specified then. Abraham gave the rest of the world religions (Dat). By that he paved two paths, but the difference between them wasn’t so big yet. Yes, these are two opposite attributes, in order to receive and in order to bestow, but in a rather minor “thickness” of the desire. On one hand, a great ego called “Pharaoh” was indeed revealed in Egypt, and on top of it everything that is in a person, everything he is made of internally: attributes, discernments, thoughts, and desires. This means that in the time of Moses (Moshe) the crisis of the shattered soul was revealed (Neshama), which was unknown before. This is already a totally different level and so accordingly the Torah was revealed. Later as the ego grew, the children of Israel built the first Temple with the help of the Torah and by that attained their end of correction. After the destruction of the Temple they built the second Temple and then the long descent began. 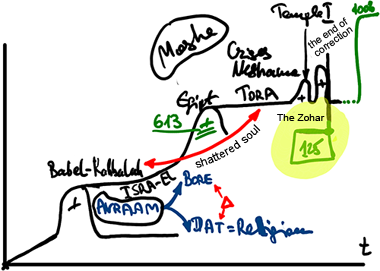 Here, before the end of the descent, The Book of Zohar was written. On one hand, great discernments of the previous level were still kept here, but on the other hand, the last level of the ego began to appear. Therefore the authors of The Zohar relied on all the 125 degrees with regard to the destruction and with regard to the attainment. This is why The Book of Zohar is very special: It includes all the Light that will be revealed in our times on the background of the biggest ego that will bring us to the complete end of correction. The Book of Zohar symbolizes this state and tells us about all the states of the end of correction. These are the states Rabbi Shimon’s son Rabbi Elazar especially speaks about. We have been through an interesting phase of the general human evolution. After humanity has evolved for hundreds of thousands of years, it has reached the end of its development. In our time, we feel it as a general crisis that is not just an individual transition in technological, political, social, and economic aspects of our life, but something that is totally new! Therefore, we have no idea what this new world is, this new regime, this new state. It is impossible to see them in our ego because they have to be revealed in a totally different attribute, in the attribute of bestowal. For the first time in history we will go through such a change, such a transition phase, and we have to pass through it. Negative states will force us to correct ourselves, either by suffering or consciously. Until today humanity has evolved automatically, instinctively, as the ego pushed us from the inside and people were not free to do anything by themselves. People acted unconsciously by the force of desires and their formations that were revealed under the pressure of external forces, but this is over now. The correction must be conscious. This means that first there is the recognition of the actions and the actions against one, since otherwise it will be automatic, egoistic actions again without any participation on our part. It is because the rest of our evolution is built only above the ego and in contrast to it. Here we have to develop a second component which is above the egoistic, an altruistic one, and to advance together. We have come along a certain way in our egoistic development and now this phase is over. 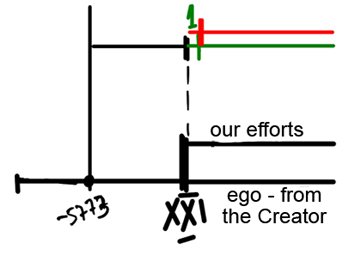 Starting from the 21st century, the egoistic and the altruistic evolutions should be parallel. The upper component (see the drawing) are our efforts and the lower component is the way by which the Creator pushes us forward by summoning uncompromising actions in us, disregarding our responses. Thus we advance. Later, nature, the Creator, will push us forward, but it will already be by considering our efforts. What Will Sprout Out Of Us?